So the Collatz Conjecture came to mind. I took a look at the Wikipedia article and was struck by a couple of things: I liked the stopping time (the number of steps you have to take to get from the given starting number to 1) plot and the graph showing the paths from certain starting numbers to 1. Both also disappointed me for not showing enough data; this had clearly been done for clarity. 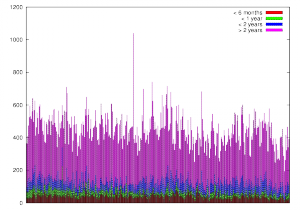 Fair enough, but sometimes if you throw enough data in a visualisation it just “looks” right. Right? (OK, this is far from true). 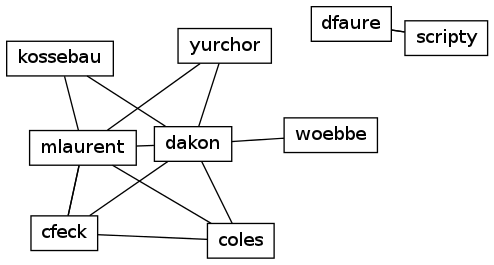 So, since it had been a while since I had last dusted off my Python and Graphviz skills, I thought I would try to replicate these visualisations, just with more data. For some time I have been hesitant to start publishing data about usage of Git. You see, when a community changes a tool as fundamental as the SCM it will need to change its processes (to some degree). Of course, this is often the reason why the SCM has been switched. It is also the first reason why it is difficult to compare SVN data from “before” to Git data from “after”. Reason 2 is that the two systems work in very different ways. A commit in a DVCS is very different from a commit in a centralised system. It is probably the “push” that is more comparable. Right? Right?? Human factor: The initial large drop in commit rate could easily be caused by people needing to learn how to use Git properly. Process factor: Git allows the user to squash multiple commits into one. The change of tool will always have human and process impacts. Here I have suggested just one of each; there are many more. But these factors plausibly explain my concern with coming forward with Git data… It is up to me to make it absolutely clear why (or potentially why) the figures change in the way that they do. Whilst the need for education and commit squashing are two factors that might apply to any project, the factors that actually apply can only really be revealed by those directly involved. Watching the new trends develop over time is going to be fascinating. OK, now KDE is 15 years old, it is time for my work to grow up and start looking at git. One of the questions I get asked from time to time is how much code rewriting I will need to do in order to for with git. Thankfully… none. So What Does 15 Years Of KDE Look Like? So, I thought I would take a quick look at what KDE community “looks” like after 15 years under development. So here I will briefly show off three visualisations with no particular comment. I will just leave them here for your amusement. For the uninitiated, a quick lesson: Each column in this visualisation represents the commit history of everyone who has committed to KDE SVN. Each row represents a week, with the most recent weeks being at the top. If the contributor committed during that week, they get a green blob, otherwise it is left empty. For each column the committer, the date of their first commit and the % of weeks in which they committed (of those they /could/) is given. I will admit that I have doctored this data ever-so-slightly in order to filter out the days in which script went crazy and created 1000s of commits by itself. So there you have it, 15 years of KDE development reduced to just three pictures! Of course, I could try and do 1000 more visualisations of the work in KDE SVN and still get nowhere near to telling the whole story. 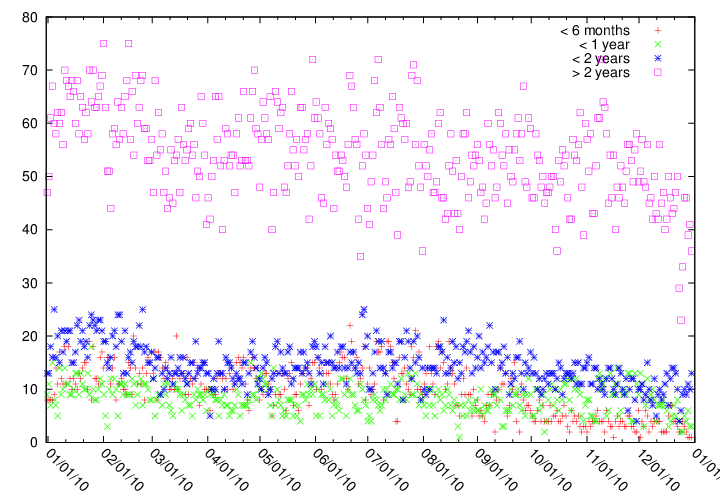 As the commits and committers plots show, KDE git really is the place to be. 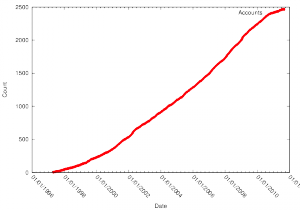 It is incredible how quickly contributions to KDE SVN have dropped to circa 2001 levels. So, a big “congratulations” to my chums in the KDE community. Happy birthday and all the best for the next 15 years! So, in the not too distant future KDE will turn 15 years old. This is normally a time when I will go back and reflect on lessons that can be learned from past activities in the SCM. This year is no different. 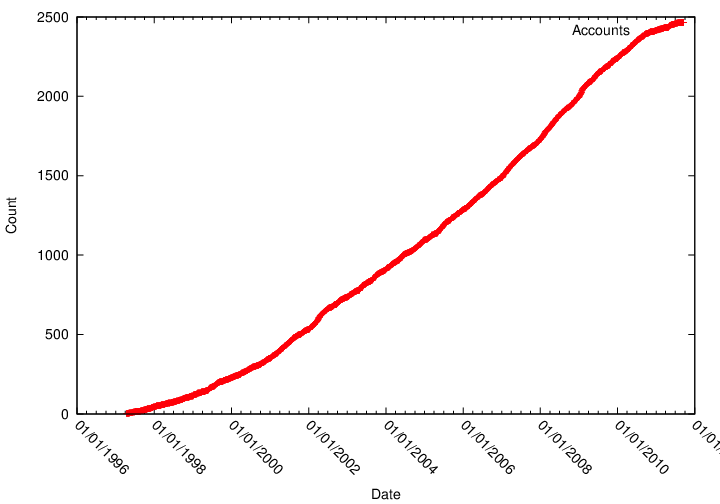 Number of KDE committers (accumulative) since project foundation (click to enlarge). 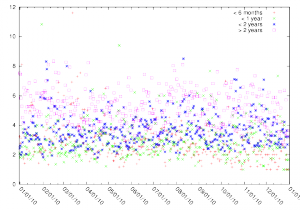 This plot shows, for each day, the number of accounts that had committed to the SCM up to and including that day. As you can see, lately the growth rate is starting to tail off. Again, the most sensible hypothesis is that fewer new contributors are using SVN, but git instead. What are we looking at here? 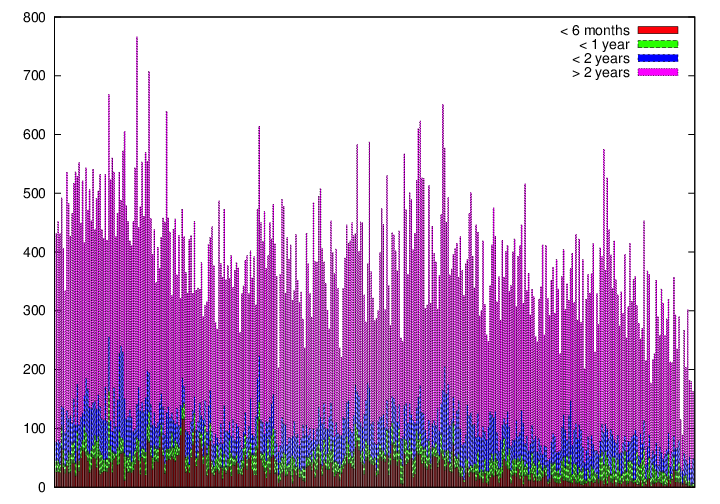 This shows, for each day in 2010, the number of daily commits in KDE SVN. Each day is colour coded to show the commits made by those contributors who have been “around” fewer than 6 months since their first commits, less than one year, less than two years and more than two years. It is plain to see that the contributors who have been involved for more than two years are contributing the most (commits per day). Now the question I left us with last time was: Is this because there are a larger number of committers in this category or is the commit rate just higher? So, here’s a question for you all: Does it feel a little odd to you that the committers who have been around for fewer than 6 months have similar commit rates to those who have been around for more than 2 years? Old Gits Hang On To SVN? So Lydia asked me about having slightly more fine-grained information about daily commits. She pointed me to this video which at the 15-minute mark has a visualisation for people contributing to Wikipedia. This visualisation reveals information about for how long people have been contributing to the community. Plots this data for arbitrary time periods using gnuplot. The vast majority of work is being conducted by people who have been in KDE for over 2 years. 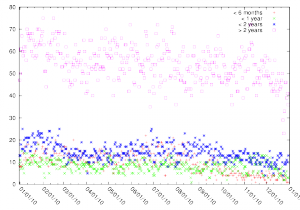 Just by looking you can see that, overall, the KDE SVN commit rate has dropped between 2009 and 2010; almost certainly caused by migration to git. But are the golden oldies really the ones holding on to SVN the tightest? Actually, no. There is nothing particularly significant in this (statistically or otherwise). There goes that theory. One last thing that I think is worth mentioning. Take a look at the < 6 months commits for 2010. Notice a growth pattern around the Summer? I think you need to look really carefully to see the same in 2009. 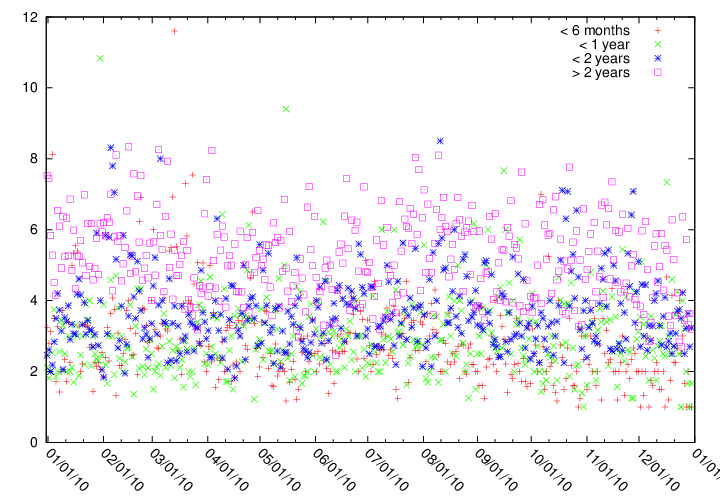 Still, I think there is some indication here of the impact of Google Summer of Code and Season of KDE. Throwing Artefacts at the Oracle. Paul is blogging? He must be delayed in an airport lounge again. So, my previous work on Oracles was a starting point on a long journey. The destination? Being able to automatically identify who the “core team” of SCM contributors to a project are. Not particularly easy. Before I expand on the idea of how we get at the core team, I want to throw more data into the mix. Analysing more of the same type of data, after a certain point, will rarely get you to a better answer; sometimes we need something new. Different data. In this case, I want to expand how representative my graphs are of what goes on inside the SCM by also including the artefacts… files. When we look at this particular example, we see there is very little sharing of artefacts. Maybe everyone works in their own branch? Maybe everyone hates each other? Maybe the codebase has been lovingly modularised and the community with it? (This is highly likely and is caused buy something called “Conway’s Law“). Here is where things get a little messy when it comes to identifying the core team… We cannot make assumptions about these clusters, but their presence is important. Allan Winter (the Kaiser Soze of KDE PIM) creates a branch to work on a particularly fiddly task; Thomas McGuire (the boy-wonder of KDE PIM) creates a release branch. To my scripts these look the same (i.e. both Allan and Thomas appear to work on a lot of artefacts alone). 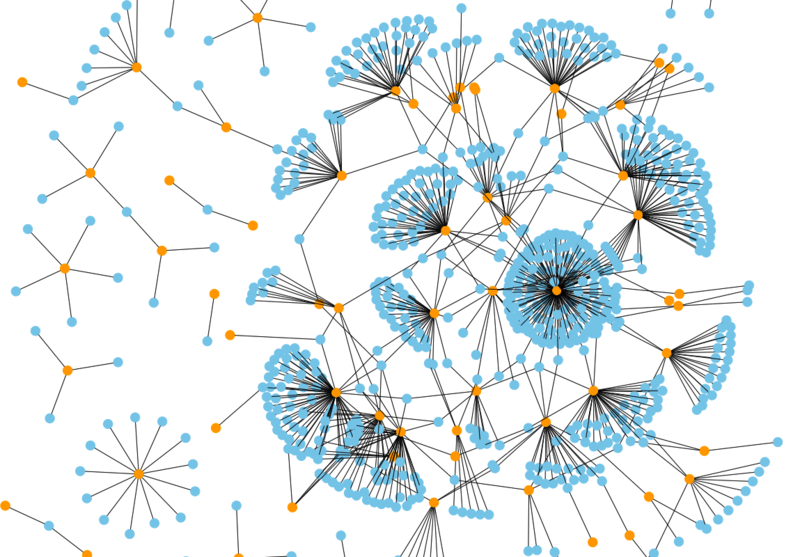 Along comes David Faure (of course); he does not create a branch at all, he actually just has a module of code that he works on and no-one else touches (because only David has the brains for this)… Again, we see an orange node with a cluster of blue nodes around. Long story short, it is non-trivial to automatically assess what is causing the clustering. Either way, it is always the result of something going on in the SCM related to either personal or project process. So I will continue to treat them equally when I do the maths and visualisations. Now what happens when this type of representation is run through the Oracel of Ervin. Well, I don’t know (there are far to many nodes here, it would probably take days to process this). But there is certainly something we can predict, just by thinking about this… The central node, as revealed by the Oracle of Ervin, might actually be an artefact and not a committer. Now there’s a thought! More on that another day. The community being visualised here (not particularly relevant). 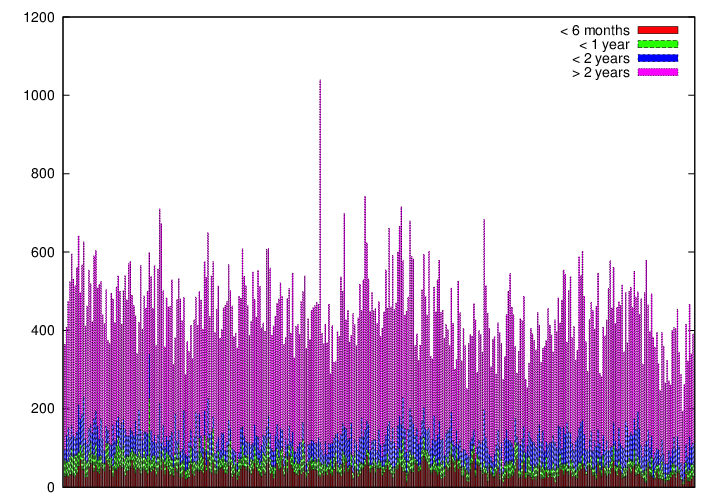 How long a period of time the visualisation represents (very relevant). Imagine the log is one day, or a month, or a year, or one release cycle… Does your interpretation of the clustering change? So I am sitting in the lounge at Newark Liberty airport and I am not entirely happy with my last blog post… which I wrote in the lounge at Chicago. Not happy because, whilst I addressed his point, I did not go the extra mile and show Rolf how the Oracle tool works in the context of KGPG. After all, the reason I do what I do is because I want to help contributors understand their communities better and Rolf had made some assumptions that might turn out to be incorrect. So, as it turns out, Rolf is bang in the middle of the KGPG community with a score of 1; we might have guessed this. Now the links between Rolf and everyone else might not necessarily indicate real-time collaboration, but they do show that he worked on the same files as other people in the KGPG community within the space of a year (just 2 releases). Now perhaps none of this is news to Rolf. But, if nothing else, this little exercise has just gone to prove that dfaure really does get everywhere in KDE. Who Needs Oracles? A Valid Question. 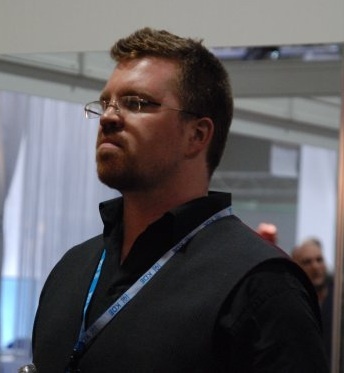 So, Rolf asks “Who needs oracles?” Sadly his blog does not (appear) to allow me to respond in comments, so I will post my thoughts here… It is a perfectly valid question after all. First, most of the things you would get from this is at least wrong for some KDE modules. Not true. I am producing mathematical models of the development community using graphs. Not an uncommon approach to issues of social networking. It is equally possible to further model aspects of these models using equations. This is the beauty of maths. But this is also the downside… Models are, of course, abstractions. So information is lost. Think about the London Underground map. How do you get from South Wimbledon to Wimbledon? The map is great for its purpose (telling people how to get around the London Underground) but it is missing crucial information for other purposes (to get from South Wimbledon to Wimbledon you should either walk or take the bus). As an aside… If you are a fan of the London Underground map, you should check out the London Connections map which does include other forms of public transport. What is important here is that we (those creating the models) explain how the model works and why it is fit for the purpose…. More on the purpose later. When you build that oracle for KGpg you will find some connections. But looking back at the last two years or so I only remember one recent commit from Burkhard that was the result of collaboration. Perfect! The model works! It will tell me that those collaborators are collectively the Orcale. Yes, there is a risk that there is one contributor who only ever works alone. This is a small resk inherent in the model (the model assumes that Free Software development communities are based on open collaboration). Some, sure. But mine is an entirely different network with an entirely different purpose. That by no means indicates that my model is either without purpose or not fit for that purpose. The idea is to show if there are possible paths from you to other keys. Very useful. But is this any more useful than knowing how the development community is structured to, say, those interested in the management of the community? Why am I bothering with this? 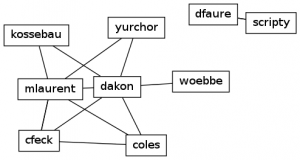 Well, if we wanted to somehow automatically find the “core team” of a Free Software community, the most connected contributor makes a good starting point. Do I say that my approach is perfect and finds the one true core team? No. It is just a good starting point.